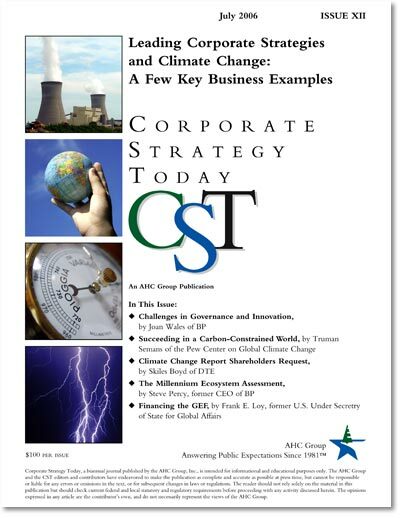 This edition of CST includes fascinating case studies about how companies are analyzing and addressing the threats and opportunities of a carbon-constrained world. Some companies are being coaxed into action, some are required to take action, and some have the right environment where taking action has created additional profitable business opportunities. "CEO Table" by Erin Crotty, AHC Group Senior Associate, former Commissioner of New York State DEC, and President of The Crotty Group, LLC. This article describes the evolution and complexity of BP's climate change strategies, including BP's own environmental footprint, a reinvention of its energy products to go beyond petroleum, and a recognition that their climate change strategies are both a business opportunity and a responsibility. Truman Seamans of the Pew Center on Climate Change details the inevitability of a stronger U.S. climate change policy, the increasing business leadership on climate issues, the factors that influence corporate climate strategies, and the effective business strategies that address climate change. Skiles Boyd of DTE Energy describes how inquisitive shareholders can represent divine intervention by increasing corporate transparency and uncovering business opportunities. Over the past several years, the author has worked on the United Nations Millennium Ecosystem Assessment. Steve's article brilliantly points out that ecosystem degradation presents threats to businesses through high costs, supply disruption, government restraint and stakeholder demands, and, simultaneously, opportunities to businesses through new technologies and business models. Frank Loy, the chief U.S. climate change negotiator in the second Clinton Administration, provides an international perspective on the latest current events regarding climate change, the Bush administration, and what Europe really needs to do to be the global leader on climate change. Why has the AHC Group offered this special climate change monograph? For 25 years, we have been known to publish "state-of-play" trustworthy analysis of key trends to management on corporate strategy. Current energy and oil price volatility, and mounting environmental checks regarding carbon trading, climate change, brand positions, and the future of oil reserves make this monograph's family of related articles both timely and worthy to share with your officers, top operating people, IR staff, and your EHS executives. Please call 518-583-9615 if you'd like us to mail you a hard copy for only $100. This designed copy is visually appealing for Board use and leadership council.